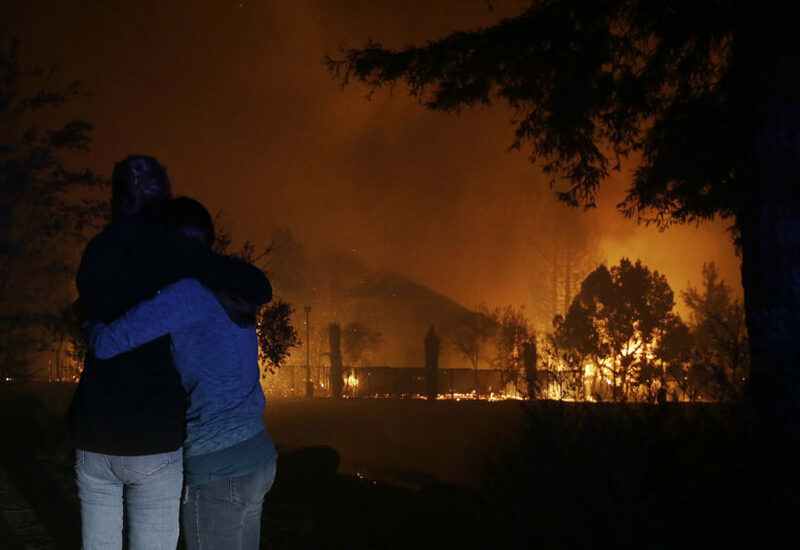 (by Sonali Kohli , Javier Panzar , Paige St. John and Dakota Smith, Los Angeles Times) – One person has died and at least 1,500 homes, businesses and other structures have been destroyed as more than 14 fires ravaged eight counties throughout Northern California on Monday, authorities said. The death was related to the Redwood Valley fire in Mendocino County, according to the Mendocino County coroner’s office. The vast devastation over just a few hours made this firestorm one of the worst in California history, with Gov. Jerry Brown declaring a state of emergency. 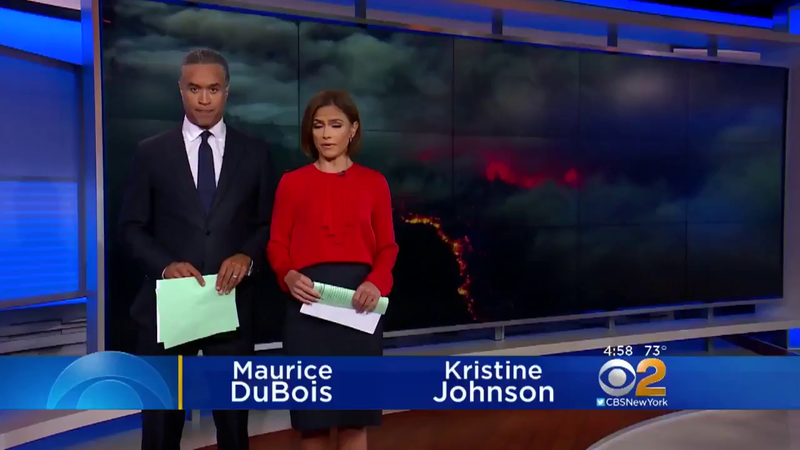 There have been injuries and people are unaccounted for, said Janet Upton, a spokeswoman for the California Department of Forestry and Fire Protection. She could not estimate the number of injuries. Officials said additional fatalities were possible as search efforts continued. One of the raging fires had Santa Rosa under siege Monday morning, with a large swath of the city north of downtown under evacuation order. The fast-moving fire jumped the 101 Freeway, forcing hospitals to be evacuated and, witnesses said, burning homes and businesses. The area of Fountaingrove appeared to be particularly hard hit, with photos showing numerous homes on fire. The Fountaingrove Inn and a Hilton hotel also burned. Officials said homes were also lost in the community of Kenwood and at a mobile home park off the 101 Freeway. Schools throughout the Napa and Sonoma valleys are closed for the day, and cellphone service has been affected in Napa County, where residents and businesses are experiencing power outages and trees have been knocked down by the wind, officials said. More than 50 structures, including homes and barns, have burned in the Atlas Peak fire alone, Napa County Fire Chief Barry Biermann said during the press conference. 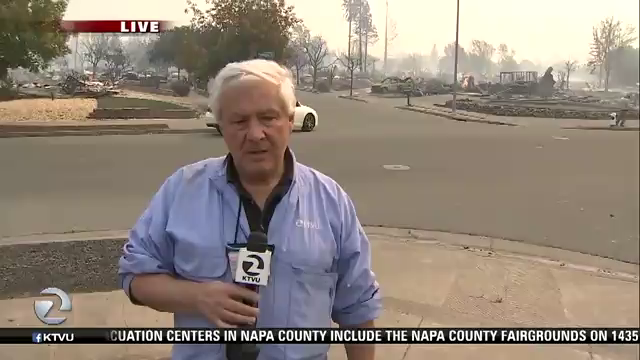 “The smell of smoke is everywhere throughout the county,” Napa County spokeswoman Kristi Jourdan said. The Santa Rosa fire began around 10 p.m. The cause of the fires is still under investigation. “We’ve had hospitals that have required evacuation…all of those take significant amount of coordination and assets to ensure… that special needs populations and others that require special assistance are taken care of. That will remain our priority,” said Mark Ghilarducci, director of the California Governor’s Office of Emergency Services. There have been a number of injuries and “possibly some fatalities,” Ghilarducci said. “This time of year is when historically the state’s largest, most damaging and most deadly fires have occurred,” Upton said. “Critical fire conditions fanned by high wind” act as “a fuse for sparks,” she said. It’s similar to the conditions that caused one of the most destructive fires in Northern California history, the October 1991 firestorm that struck the Oakland and Berkeley hills that killed 25 people and destroyed more than 3,300 single-family homes. Los Angeles Times staff writers Makeda Easter, Rong-Gong Lin II, Joy Resmovits amd Phil Willon contributed to this report. Reprinted here for educational purposes only. May not be reproduced on other websites without permission from the Los Angeles Times. 2. What don’t officials know yet? 3. Why are some evacuation centers already filled to capacity? 4. List other disruptions caused by the wildfires. 5. What was the initial cause of the fires? 6. What conditions made this fire one of the worst in California history? Be specific. The Tubbs fire near Santa Rosa has burned more than 35,000 acres as of 6:40 a.m., Napa County Supervisor Diane Dillon said during a televised press conference Monday morning. 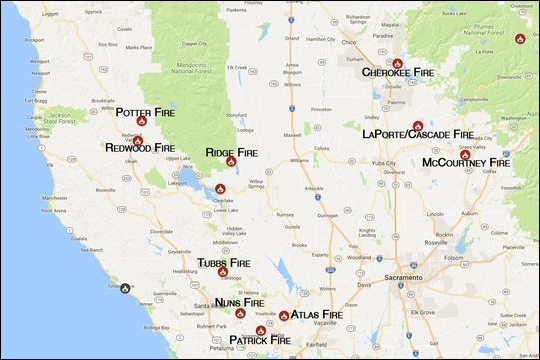 Officials said the other large fire in Napa County — Atlas Peak — has reached between 8,000 and 12,000 acres. Moholt-Siebert retreated through a 150-year-old redwood barn on his property — where his son’s wedding reception had been held in June. He jumped a fence back toward his house and fell to the ground to catch gulps of less smoke-contaminated air before reaching his home. Around 2 a.m., the Sonoma County Sheriff’s Office ordered evacuations around Kay Drive and Mark West Station Road in Windsor. Jen Ancic, 31, fled with her two young sons and boyfriend.